When you first bring your hamster home, you should leave him alone for a couple days. Place his home in an area that has less traffic. He will have many sounds to get used to! Give him plenty of food and make sure water is available. It may be tempting to take your hamster out to play, but that will over-stress your hamster. Your hamster should be kept in a calm environment. For a hamster to be a tame and good pet, it must be socialised. 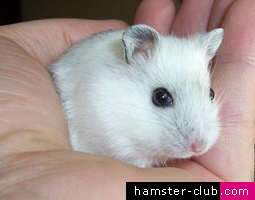 This means frequent, gentle and respectful handling that helps the hamster become comfortable with people. The younger the hamster, the easier he is to tame. Also, syrian hamsters tend to tame a little faster. With all hamsters, patience is the key. If your hamster looks scared or if he bites during the taming process, you need to slow down. Go back to the previous step or even two steps back. Your hamster should approach you in a relaxed manner several times (usually a period of over 2 to 3 days) before moving on to the next step. 1. Start by feeding him treats through the bars of the cage. Let him smell your hand. 2. Feed him treats through the opening of his cage. Place treats between your index and thumb. 3. Feed him treats through the opening of his cage. This time, place the treat in the palm of your hand. 4. After he runs in his ball place your hand inside the ball, palm up. Encourage him to walk onto your hand. This step may take some time. Limit your first play sessions to 5 minutes. It may take a few sessions before he comes out of his ball and onto your hand. Alternate steps 3 and 4, and he will eventually come out onto your hand. 5. Make sure you are sitting on the floor when you first handle your hamster. Always have his cage or ball nearby. Let him sniff and explore your hand and lap. Hamsters like to go from one hand the other hand that's placed slightly lower. They like to go onto your shoulders, but wait on this until you've handled him for a couple weeks. The average taming takes between 2 weeks to a month or more. Remember that biting is a reflex. Your hamster will bite when scared. Let your hamster climb on your hand instead of trying to catch him. Wash your hands before and after handling your hamster. He may try to nibble if you smell like food. In my opinion, wearing gloves can make taming more difficult and slows the process. Though, you being nervous is not going to calm your hamster. If you are only comfortable handling him that way, do so, but as long as you're not rushing and you follow these steps, you should be fine. When you're hamster does bite, calmly put him back into his cage. Never scold your hamster. He will not learn that way, he'll just get more scared and bite more! When first picking up your hamster, don't lift him high above the floor or walk with him in your hands. Until he's comfortable with you, he will jump. Experienced hamster owners will learn to feel their hamster on their hand and know what moves he will make.